Rural isolation gets a bad reputation as it removes humans from the supposed benefits of city life. The bright lights can be attractive, as well as shiny objects to distract, as they offer fulfillment of potential dreams-come-true. For JD McPherson, he took the solitude as an opportunity, immersing himself in his early years passion for music as he grew up in a spot that was a town in name only, the nearest grocery store an hour drive away. He began playing guitar at thirteen years old, forming local punk rock bands and learning from the style’s DIY inclusion. Exposure to the sounds of Buddy Holly gave his music and songwriting a target as well as a love for the music, and particularly the production of recordings from the early days of Rock’n’Roll. 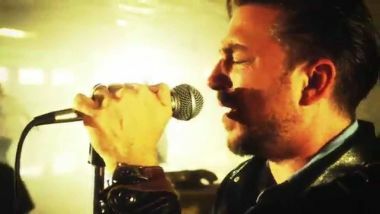 His musical education is on display in his recent release, Undivided Heart and Soul, as JD McPherson showcases the advanced degrees that he earned in translating the sounds of the past into the music of the future. Raw guitar chords are a constant on Undivided Heart and Soul as the percussion forms sonic borders with handclaps and xylophone in “Style (Is a Losing Game)” while a guitar riff maintains order as the beat riffs in “Under the Spell of City Lights”. JD McPherson allows the instrumentation on the album to propel itself to the edge of the framework on each track, leaning far over into the abyss without ever losing its footing. His confidence in the music performing as it should creates a magic within the sonic chaos that runs the gamut between the slow dance spin of memory requests of “Jubliee” to the alien guitar tones of “Lucky Penny”. 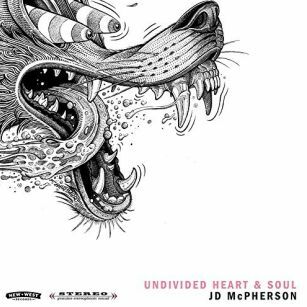 Undivided Heart and Soul lets the rhythm section of bass and drums rule on the title track as it puts a thick rubbery lead line underneath the opinions and finger-pointing of “Crying’s Just a Thing That You Do”. The album opens with the search for survival wallowing in the regimented rhythms of “Desperate Love”. JD shows all the love in his heart for Vintage sounds without succumbing to nostalgia as he uses the raw cries of the first shouts of Rock’n’Roll as a jumping off point for his songs. A tenderness softly comforts the weary traveler in “Hunting for Sugar as the beat chases ‘the Blues and a little rock’n’roll’ into a club that promises “Bloodhound Rock’ while JD McPherson exits Undivided Heart and Soul by taking the hands of listeners with the invite of “Let’s Get Out of Here While We’re Young”.